Occasionally something can cause a toenail to grow downwards into the toe instead of outwards as normal. When this happens it can become painful to walk on that foot. The toe can become sensitive and swollen. If the ingrowing toenail breaks the skin, the toe can also become infected. In minor cases, a toenail can gradually be encouraged to return to normal growth and shape using simple techniques at home. Sometimes, though, the condition becomes worse over time and will need surgical treatment. 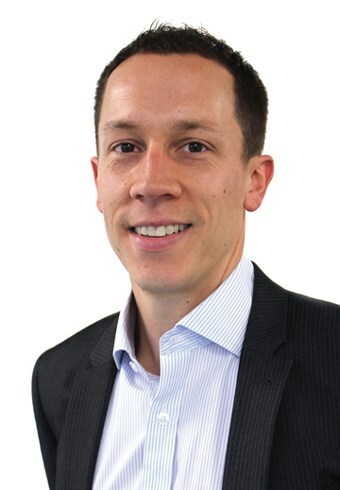 As the NHS is often unable to provide these types of treatment promptly, many patients look to the private sector to have their toenail treated. 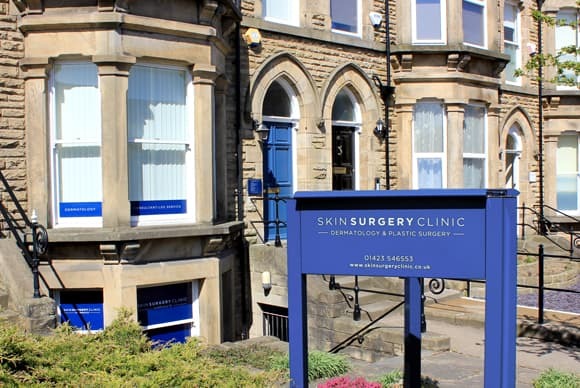 At Skin Surgery Clinic you can be seen quickly by an experienced GP with specialist training in surgical procedures. 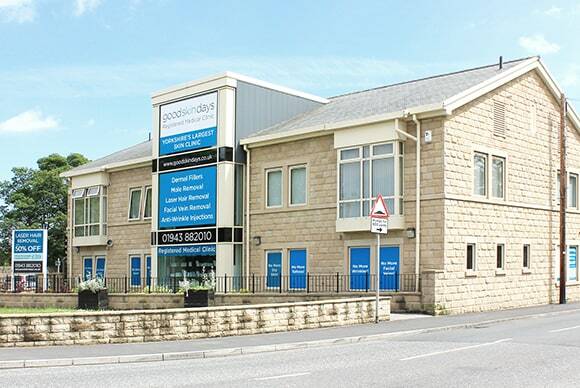 Treatment takes place in a Minor Operations Suite within our fully CQC-regulated and inspected private medical clinic. What are my options for Ingrown Toenail Treatment? If your toenail has been painful for some time or has become infected, Skin Surgery Clinic offers ingrown toenail surgery carried out by a specialist GP. The procedure is known as a wedge excision or a partial nail avulsion. After applying local anaesthetic to the toe, your doctor will remove a section of the nail on the side where it is ingrowing. The nail is cut to the base and the ingrowing section is removed. The nail bed is then cauterised with phenol to prevent the nail from re-growing and causing further pain. After your procedure you will be given instructions on how to care for your toe for the next couple of weeks. You will need to wear loose footwear as your toe will be dressed and bandaged, and you won’t be able to do some types of activity, such as running. As the toe begins to heal you may wish to take painkillers such as Paracetamol for a couple of days. 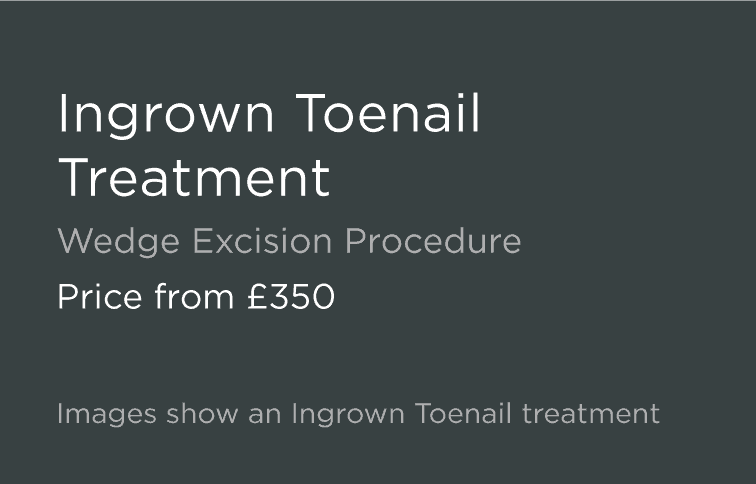 We can begin your Ingrown Toenail treatment with an Online Consultation. Our highly experienced nurses and surgeons will review your details and photos. In many cases this allows you to book straight in for your surgical procedure without needing an initial appointment. A number of factors can contribute to the edge of a nail beginning to grow downwards into the skin. Most commonly an ingrown toenail begins after poor trimming of a toenail or wearing footwear that is too tight around the toes. Cutting your nails too short and rounded at the edge, or wearing shoes that put pressure on the edges of your toenails increase the risk of a nail beginning to ingrow. Sweat can also contribute, so ingrown toenails are often seen in active people or those who wear tight, non-cotton socks. They can also be caused by an injury to the nail or a fungal infection that has weakened the nail. Will the treatment prevent my Ingrown Toenail from recurring? After your toenail has been surgically treated it will be slightly narrower than before. The removed part which had ingrown into the toe will not grow back. It is sensible to think about what may have caused your ingrown toenail though, so that you can avoid another case in the future. This might mean being more cautious with your nail trimming, leaving nails flatter rather than rounded at the corners, or it could mean wearing looser footwear or lower heels. Our GP and nurse can give you advice at the end of your procedure appointment.